Micro-environment plays important role in the pathogenesis of CLL by providing protective niche for CLL cells. 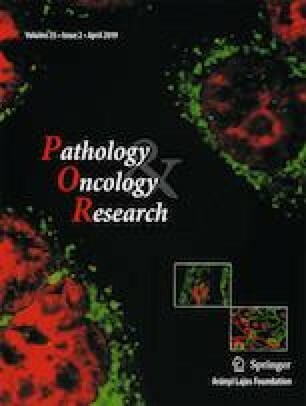 Several molecules play important role in communication between CLL cells and immune cells like CD86.Some of the data suggest that CLL patients with high CD86 level need earlier treatments and cells with higher CD86 expression has higher proliferation rate but the role of CD86 in the survival and proliferation of CLL cells is unclear. We investigated the effect of CD86 expression to CLL cells in 50 peripheral blood and 15 lymph node biopsy samples from CLL patients. Our results showed that the expressions of CD86 increased significantly after 7 day culturing in medium, or in the presence of bone marrow stromal cells (BMSCs). We found positive correlation between CD86 and CD23 expression (p < 0.05), but no correlation with other markers. Furthermore, no correlation were found between the CD86 expression and the proliferation of CLL cells. Analysis of clinical data showed that cases with high CD86 expression had lower level of serum lymphocyte count (p < 0.04) at the time of the diagnosis. CD86 shows multiple appearances in the lymph nodes containing pseudofollicules, but no correlation was found between CD86 positivity, and Ki67 positivity. Our results suggest that the use of CD86 molecule as a proliferation marker for CLL is highly questionable. However, the CD86 molecule may interfere with the immune system of patients with CLL by activating and depleting immune functions. That can be the reason why CD86 positivity may mean worse prognosis. This work was supported by the NVKP_16-1-2016-0004 grant of the Hungarian National Research, Development and Innovation Office (NFKIH).